The VESA-compliant DDR1527SDC Dual Vertical Flat-Screen Desk Stand/Clamp Mount frees up valuable space on your desk, table or workstation by allowing you to mount two flat-panel displays on a vertical pole. Ideal for home or office, the DDR1527SDC fits most flat-panel displays from 15 to 27 inches. You can use it as a desktop stand or clamp it to a flat surface up to three inches thick. One-touch adjustment lets you optimize viewing angles and improve ergonomics as you switch tasks during the day. 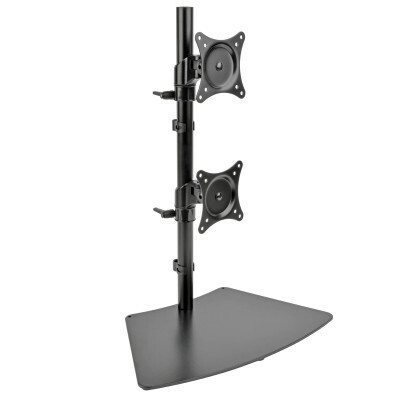 Adjust the dual mounting plates independently for angle and height to give you maximum flexibility in positioning your displays to fit your environment and comfort level. A 20Â° swivel and -20Â° to +20Â° tilt capability minimizes glare and provides comfortable viewing from multiple angles. A 360Â° rotation lets you view your displays in portrait and landscape orientations. Each mounting plate supports flat-panel displays up to 8 kgs. (18 lbs.) The durable all-metal frame with scratch-resistant powder-coated finish tolerates frequent handling and blends with any dÃ©cor. Included cable clamps organize cables and secure them to the vertical pole to prevent clutter. Mounting hardware is included. Conforms to VESA-compliant displays with hole patterns of 75 x 75 mm and 100 x 100 mm. - Fits most flat-panel displays from 15 to 27 in.